We live in a world that seems to be forever changing...a new world with dynamic challenges that requires young enthusiastic adults capable of playing positive and fruitful roles in organizations and communities. The Symbiosis School for Liberal Arts strongly believes in the importance of a comprehensive education in preparation for career advancement and for the exercise of leadership. We believe organizations and society have an urgent need for creative individuals who will readily learn on the job, after having been exposed to a broad and comprehensive education. Based on the experiences with liberal arts in the last 11 years, we know that a sound liberal arts education provides a much needed cultural orientation to the world in which we live and equips students with ideas, analytical and communication skills, and global perspectives along with the ability to synthesize knowledge and make informed value judgments. The liberal arts programme at Symbiosis School for Liberal Arts is a holistic programme designed as a combination of multi, inter and transdisciplinary learning focused on transferability of skills, employability and a spirit of enquiry. The focus is on critical thinking, research, analysis and writing along with civic mindedness. The programme aspires to augment and develop individuals who are critically conscious and able to find a healthy balance between professional and personal growth. Our Liberal Arts programme is styled very closely on international models while also fulfilling the demands of a higher education programme in India. Students engage with a wide range of courses with the freedom to pick and choose Minor and Major areas of specialization from areas previously considered to be ‘academically incompatible’. A student can combine subjects like Business studies as a Major with a Philosophy Minor or Mathematics & Statistics as a Major with an Anthropology Minor. This gives students a chance to enter hybrid workspaces where expertise from two disciplines offer and edge over others. Unique combinations like Biology and Economics opens up avenues in fields like Health Economics, Policy Making, Pharmacare etc. SSLA offers students the opportunity to study a four-year full-time Bachelor of Arts (Liberal Arts) Honours Degree and Bachelor of Science (Liberal Arts) Honours Degree program covered over eight semesters. It is mandatory to complete a minimum of 198 credits to graduate with a B.A / B.Sc (Liberal Arts) Honours degree. The students are expected to complete 20 core (compulsory) courses including a Community Outreach Project and a Seminar Paper + 6 general (electives) + 1 Minor specialization subject (6 papers) + 1 Major specialization subject (12 papers) including an Internship and a Research Project. Major Specialization: Mathematics & Statistics, Computer Studies, English, Economics, Psychology, Sociology, Philosophy, Anthropology, Media Studies, Business Studies, International Relations and Political Science & Public Policy. Minor Specialization: Biology, Women and Gender Studies, History, Film Studies, Peace and Conflict Studies, Physics, Performing Arts and Law. The degree awarded shall be a Bachelor of Arts (Liberal Arts) Honours for those majoring in courses such as Economics, Business Studies, Media Studies, Sociology, English, Psychology, Political Science & Public Policy, Philosophy, International Relations and Anthropology. The degree awarded shall be a Bachelor of Science (Liberal Arts) Honours for those majoring in courses such as Mathematics & Statistics and Computer Studies. The programme requires a student to complete: 20 Cores (compulsory courses including Community Outreach Project and a Seminar Paper) + 6 Electives + 1 Minor* specialization (6 papers) + 1 Major specialization subject (12 papers, including an Internship and a Research Project + Additional Minor (6 papers) / Additional Electives (6 courses) / Double Major (10 papers) without the Minor*. The need for an in-depth subject specialization is pursued through the Major (ten papers, a two month long Internship and a Dissertation/ Research Project) and Minor specializations (6 papers) offers the student twin knowledge foundations that may often be applied in complementing roles suited to the professional needs. Specialization courses (which are in the form of Majors and Minors) shall be chosen in the 2nd semester and will be taught from the 3rd semester onwards. courses spread across genetics, mathematics, environment, philosophy, literature, performing arts, theater, religion, art, etc is taught with an inter, multi and transdisciplinary perspectives to bring together a 360 degree understanding. o Community Outreach Project integrated within the curricula with a 2 month long community service, a report written and presentation on the basis of the field work intends to foster critically conscious citizens of the world. an Internship Project Report along with a viva and presentation. o SSLA encourages a culture of research through the Dissertation or the Research Project and the Seminar Paper. Core courses on Research Methods, research proposal and field experience help students perfect their research skills over a period of four years. The seminar course is a mandatory requirement at the end of which the students submit a publishable paper. o Inter University credit courses / Integrated Disaster Management Program / Audit Courses / Global Immersion Program are some other courses that students may engage with as per SSLA / SIU rules. 198 Credits; with 63 credits to Cores, 12 credits to FCP including Service Learning /COP, 24 credits to Generic Elective, 35 credit to Major Specialization Core, 16 credits to Major Specialization Electives, 24 credits to Minor specialization Cores, 24 credits to Additional chosen Minor Specialization Core and 1 mandatory Audit. 198 Credits; with 63 credits to Cores, 12 credits to FCP including Service Learning /COP, 24 credits to Generic Elective, 35 credit to Major Specialization Core, 16 credits to Major Specialization Electives, 24 credits to Minor specialization Cores, 24 credits to Additional Electives and 1 mandatory Audit. Additional Major Specialization Electives, 8 credits for Additional Electives and 1 mandatory Audit. No Minor Specialization. To encourage students to learn beyond the curriculum, SSLA is introducing the concept of an “Audit Course”. This will not only aid in the interest process of an individual but also will also wide variety of knowledge or subjects. 1. Students have to maintain an academic record with 65% marks (overall) in the previous semester. 2. Students have to maintain a 75% attendance (overall) in the previous semesters. 3. Students cannot have a TNG or backlog at the time of application. In order to apply for an audit course, a procedure similar to that of the selection of electives, is followed. The admin department shall email students with the list of courses available as audit courses, each semester. Students are alloted the courses on the basis of their preference and the eligibility criteria mentioned above. If a student is eligible for an audit course, the student will be required to make the payment at the accounts department and provide a receipt of the same to the admin department. To encourage students to learn beyond the curriculum, SSLA is introducing the concept of an “Extra Course”. This will not only aid in the interest process of an individual but also will expose them to a wide variety of knowledge or subjects. 1. Students have to maintain an academic record with 70% marks (overall) in the previous semester. In order to apply for an extra course, a procedure similar to that of the selection of electives, is followed. The admin department shall email students with the list of courses available as extra courses, each semester. Students are alloted the courses on the basis of their preference and the eligibility criteria mentioned above. If a student is eligible for an extra course, the student will be required to make the payment at the accounts department and provide a receipt of the same to the admin department. The list of options mentioned above is an exhaustive list of options, open to students at SSLA. Any combination/option that isn’t listed above is not permissible, as per the programme structure. SSLA now offers students the ability to opt for a Double Minor. the ability to select one major to specialise in along with two minors. This option provides students with the ability to acquire a greater amount of knowledge and qualifications while at the same time allows them to study two minors to compliment their major area of specialisation. Students are required to select their majors and minors towards the end of the second semester. In order to apply for a double minor, a procedure similar to that of the selection of electives, is followed. The admin department shall email students with the list of majors and minors available. Students are required to select the major-minor option i.e Standard Major-Minor, Double Major, Double Minor, they wish to opt for along with their choice of major and minor areas of specialisation. Students are alloted the same on the basis of their preference and the eligibility criteria mentioned above. If a student is eligible for a double minor, the student will be required to make the payment at the accounts department and provide a receipt of the same to the admin department. For the second minor, the fee will not be refunded after the 4th semester, if a student decides to drop it. SSLA now offers students the ability to opt for a Double Major. the ability to select two majors to specialise in but no minors. This option provides students with the ability to acquire a greater amount of knowledge and qualifications while at the same time allows them to not be tied down to only a single area of specialisation. Students are required to select their majors and minors towards the end of the second semester. In order to apply for a double major, a procedure similar to that of the selection of electives, is followed. The admin department shall email students with the list of majors and minors available. Students are required to select the major-minor option i.e Standard Major-Minor, Double Major, Double Minor, they wish to opt for along with their choice of major and minor areas of specialisation. Students are alloted the same on the basis of their preference and the eligibility criteria mentioned above. If a student is eligible for a double major, the student will be required to make the payment at the accounts department and provide a receipt of the same to the admin department. For the second major, the fee will not be refunded after the 4th semester, if a student decides to drop it. SSLA aims at offering a multi-disciplinary and holistic educational program that assessesAnd evaluates students on the ability to think critically and develop innovative solutions to problems rather than just focusing on facts and figures. Note: Curiosity is an academic software.. The programme structure at SSLA follows a semester pattern with Continuous Assessments (CA) and a Semester End Evaluation (SEE). Both components are designed and conducted by the faculty to suit the needs and learning outcomes of the course. Faculty responsible for the courses will devise their own creative methodology (which may vary from course to course) that may include papers, projects, surveys, weekly activities/assignments, individual and group presentations, class participation, case studies, etc. Semester End Evaluation may also not be the typical written examination, but maybe innovatively devised. In-class assessments/submissions: essays, presentations & discussions, critical/analytical papers, projects, book & movie reviews, short tests, quizzes, open book tests, term papers, etc. Outside the classroom assessments: site visits, research, field trips, etc. Students are informed by each faculty about the assessment formats and criteria during the first week of classes of every semester. Note : Curiosity is an academic software that the faculty use to upload internal and external marks, attendance and reading material that can be accessed by both students and parents. Criteria for Continuous Assessments (CA): Continuous assessments (CA) are of a minimum of 60 marks and a maximum of 8O marks with a minimum of 3 components as a part of the course requirements for the semester. The faculty administer, on average, one assessment every month of the semester as part of this continuous assessment process. The criteria for these assessments are provided in the course syllabus that the faculty make available to students during the first week of classes. Criteria for Semester-End Evaluation (SEE): At the end of the semester, evaluations are conducted with at least two different components, to test the students on their knowledge and skills gained from taking the course. Relative grading: The grading of students will be done based on the relative performance of the students, as compared to the rest of the class. Continuous Assessment and Semester-end examination and Practical (if any} will be separate heads of passing. Passing in a course means securing 40% of absolute marks in each of the heads. Separate grade points will be calculated for continuous and semester end examinations and the weighted average of both will be the grade point for the course. The Floating Credit Program at SSLA is to ensure that all students are exposed to various critical aspects of knowledge that help inculcate morals, values, ethics, civic sense and also enrich the personality of each student. These can be earned by attending different seminars, representing college in sports, community outreach programme and many other extra-curricular opportunities that SSLA provides. Community Outreach Project (COP) (compulsory 6 credits and 200 hours) to be completed by Semester 4 followed by the submission of the COP Report, Presentation and Viva in Semester 5. Please note: The number of credits accumulated will depend on the complexity of work or the number of hours of participation over the semesters. The number of hours will be calculated on the number of hours of the programme/activity/ workshop/conference attended or participated in. If 40% of the total number of hours offered are not completed by the student, he or she will not be graded and will receive a backlog in FCP. Credits and Grades will depend on the event, number of hours of student participation, report/outcome submitted by the student after the event, etc. The Director's decision will be final. Grades will be awarded depending upon performance. Depending upon the involvement, the grades of the students will vary. 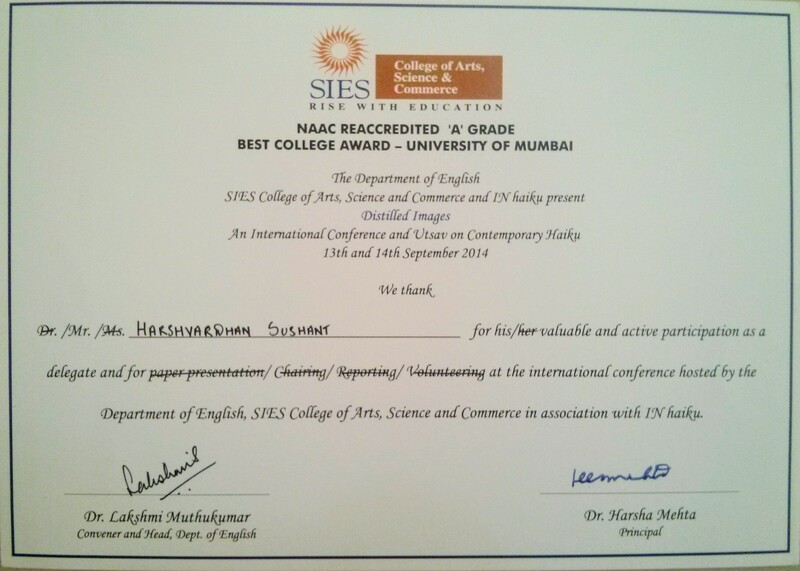 Non-academic article based on conference and printed in a newspaper/ magazine. The details of FCP activities participated in will be recorded on Curiosity after receiving an email from the student. Please email and submit written proof (with your name and PRN no. on it) to Mr. Nikhil Ranpise by the first Friday of the subsequent month. No late submissions will be accepted for previous participations. For example, a conference attended in January must be recorded no later than the first Friday of February. The grades will be allotted for every event based on the proof submitted. In addition to the academic course work, students participate in a community outreach project. This outreach project aims at initiating student contributions towards social justice. COP aims to nurture students into sensitive, ethical, and critically conscious citizens who will contribute responsibly to communities and society. The Community Outreach Project is a mandatory component of the curriculum at SSLA. It carries 6 credits, and is designed to be a 2 month full-time project, to be completed over the first summer break. The minimum total number of hours required for the COP is 200 hours, on completion of which, the student is required to get a validation letter from the organisation. 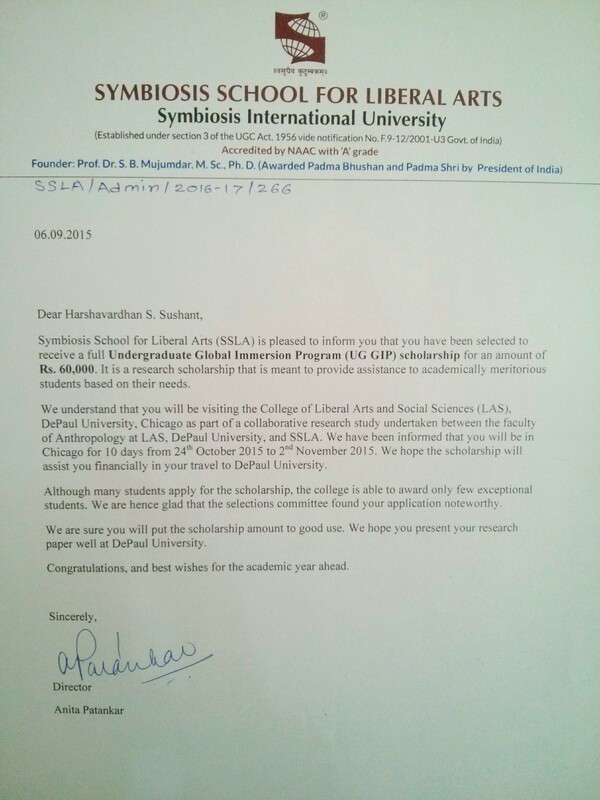 This letter will be a part of the student’s report, which is due at the beginning of Semester 5. · The student is required to write a 10,000 word report and prepare a 20 minute presentation, as well as respond to a 10 minute viva before a panel of two examiners. The student will have to set up dates with the panel of examiners allotted to him/her. It is mandatory that the student registers himself/herself with the Community Outreach Cell, before the commencement of the project. The COP batch representative will send out an online form for the same. Refer to the Student Handbook for further details about deadlines and submissions. 14060321014 Ruchi Sunil Bhutada 1) Doorstep School, Pune. 2) Dr Narendra Bhivapurkar Blindschool, Amravati. 1) Education for the children or construction site workers and street dwellers. 14060321069 Rishita Vijaybhai Parmar FRANCISCAN MISSIONARIES OF MARY SOCIAL SERVICE SOCIETY, PUNE, MAHARASHTRA, INDIA remideial classes for children of tadiwala slum and they work on women and people affected with HIV. 14060321089 Suroraj Sen Manovikas Kendra. Education (Teaching children with special needs) and Research. Manovikas Kendra: No Child Left Behind. The internship is a compulsory component of the curriculum at SSLA. It seeks to introduce the students to the realities of the industries, and to help them understand their own strengths. The Community Outreach Programme and Internship Project cannot be done in the same organisation, during the same time period. If an internship has been requested through the Career Cell, in an institution, or organisation, and is declined by the student, a polite email declining the opportunity must be sent, with a copy marked to the Career Cell. If this is not done, 10 marks will be deducted, from the overall score. The student should ideally have an internship matching his/her major or minor subjects. If the students wishes to apply for an internship in a different field, this should be discussed beforehand, with the concerned faculty. A No Objection Certificate will be issued on request. A date will be set aside for this; students are expected to collect the same before leaving college. If the internship is in the student’s family business, or if it encompasses the establishment of a student’s personal business, then details will have to be shared with the Faculty-In-Charge of the Career Cell. A detailed extent of work will need to be shared with the same. In this case, it is mandatory for students to share a report via email, every 15 days. The minimum number of hours for the internship is 220 hours, which can be spread as per the requirements of the mentor. The student may complete more hours than stipulated if the internship opportunity is excellent. 25 marks for Internship Evaluation form is to be filled by the company or mentor evaluating internship performance. The Internship Evaluation form must then be submitted to the mentor or the organisation. Students must collect their internship certificate from the institution or organisation. This certificate must be submitted before the presentation of the report, failing which, the report will not be accepted. The final report must mandatorily be submitted in the form of two hard-bound copies, and one soft copy, to be sent to the Career and Internship Cell. The report should have all proof of work, photographs etc. Details in terms of logs and more will be sent to every batch. The Internship marks will be displayed on Curiosity on the given dates. No queries from students regarding this will be entertained after the last day of display of marks. There is no re-evaluation for the Internship module. If a student does not pass the Internship module, it will be considered a backlog. He/she may have to repeat the internship process or the presentation and viva, depending on the evaluation. The report submission, presentation, and viva will be conducted in the consequent semesters. If a student does not pass the Internship module, it will be considered a backlog. He/she may have to repeat the internship process or the presentation and viva, depending on the evaluation. The report submission, presentation and viva will be conducted in the consequent semesters. The research dissertation is a comprehensive research project-based submission which is undertaken and completed by every student at SSLA. Students are expected to identify a theme for intensive study and request faculty with experience in the relevant area to be their committee members. Students are to undertake the project with due guidance over a period of three years, starting from Semester 3. The dissertation submission takes place in two stages - a spiral bound draft is to be submitted in Semester 7, and the final hardbound volume, in Semester 8. Students are exposed to the conceptual and technical aspects of a research undertaking, through core courses in Research Methodology in Semesters 2 and 3. Based on the skills acquired herein, students will work on the development of a research proposal in Semester 4, with the help of their committee members. The proposal has to be submitted before 4pm on the last working day of March in Semester 4. Failure to comply with this deadline will result in a penalty of 10 marks (batch-specific dates in table below). Each student will have a research committee consisting of two members. The first committee member will be from the area of the major specialisation of the student, and the second committee member may or may not be, as long as the student is sure that their input will be helpful for the development of the dissertation. Students are required to communicate details about their committee members to the Research Cell In-Charge by 4pm on the first working day of March in Semester 4. Semesters 5, 6, and 7 are for work on this proposal, to ensure its development into a dissertation. Students are expected to be in frequent contact with their committee members for guidance and inputs throughout this period, including for consultation on various drafts of chapters, etc. A spiral-bound draft of the dissertation, complete with respect to all stylistic and formatting stipulations, is to be submitted by 4pm on the last working day of November in Semester 7. Students failing to meet this requirement will receive a penalty of 20 marks (batch-specific dates in table below). Over January and February of Semester 8, students are expected to contact their committee members and schedule their dissertation defense. The last date to have conducted the defense is the last working day of February in Semester 8. Failure to have conducted the defense will result in a penalty of 10 marks (batch-specific dates in table below). Students who fail to submit the spiral-bound copies in November of Semester 7 are still expected to finish submission and conduct defense by the last working day of February in Semester 8. Failing this, the student is liable to receive a backlog in Semester 8, and fail to graduate at the end of 8 semesters. Students have till the end of March to make any minor revisions as suggested by the committee. No major revisions\second defense will be permitted. All students who have successfully completed their defense have to submit two hardbound copies of the final dissertation before 4pm on the last working day of March of Semester 8. Failure to comply with this deadline will result in a penalty of 10 marks (batch-specific dates in table below). How do we make a committee for the dissertation? Check the faculty specializations page and shortlist a few faculty. Approach them with your potential topic and ask them informally if they agree to be on your dissertation committee. The topic will be shaped by the student and the faculty together. When both you and the faculty agree on working together, keep a written record of this confirmation. Are we required to submit the names of our committee members, for the dissertation, to the Research Cell? Yes, there will be a form circulated for the same. Students are requested to keep proof of confirmations from their committee members in written format. How can we change our dissertation committee? They have met the First Chair committee member at least thrice in the preceding semester and have a log of the same in the handbook. The change in the First Chair has to take place at least one month before the submission of the spiral-bound draft of the dissertation. In extenuating circumstances (faculty leaving, medical conditions etc. ), changes will be approved without the above conditions. What are the exact deadlines for the submission of the drafts for our dissertations? The deadlines differ from batch to batch. Students are required to submit a progress report to the First Chair once each during the fifth, sixth and seventh semesters (sixth and seventh semesters only for Batch 2019). The report should provide an overview of the work done and specify the nature of work pending to complete the dissertation. The First Chair can, at his or her discretion, require the students to submit a written draft and make a presentation based on work completed. During the sixth semester, the progress report must be submitted before the last day of classes (April 20, 2018 for Batch 2019). The progress report for the sixth semester will be marked for 10 points. The spiral bound dissertation is due by January 4, 2019 (4 pm). The rest of the deadlines remain the same as specified in the handbook (for defense, it is February 28, 2019 and for the submission of the final hard bound copy, it is March 29, 2019 (4 pm). The rationale behind the final year seminar is to encourage and equip students to deliberate on themes in an academic fashion, and write a paper that satisfies standard academic conventions (substantive and formal). This exercise will enable students to familiarise themselves with the process identifying journals that are relevant to their work, submitting papers to journals, editing them after review, etc. The list of themes will be made available to the students on 2 June 2016. They will have a month to approach/communicate with any of the teachers on the list, and choose a moderator. Starting from August 1, faculty members are expected to conduct fortnightly or monthly sessions with their seminar students, wherein discussion on the theme and specific ideas that individual students would like to pursue, will be carried out. These sessions are intended to be oriented towards discussion, instead of teaching. The expectation from the moderator is primarily supervisory, not pedagogic. The standard convention on seminar papers is for students to present written drafts (in each session), and for the moderator as well as the other members of the group to make comments, criticisms etc. of the idea presented. The moderator is also expected to offer new readings, if any, which may be helpful in pursuing the theme further. The abstract of the paper to be written is due by 1st October 2016. By 7th November 2016 students will submit the first draft of their paper to their moderator. The paper must be reflective of three months of seminar work that preceded it. Comments and feedback will be made available by 15th December 2016. Over the next month, the draft will undergo revision and editing, at the end of which, the student will send it to any academic publication for acceptance. The second draft is due on 15th January 2017. The final paper is due on 15th of February 2017, and proof of delivery is due on the 25th of April 2017. Students are graded also on whether the work is of publishable quality. Students send their papers to various agencies of publication and submit proof that their papers have at least been submitted. How can I choose my Seminar theme? Themes and faculty names will be circulated during the summer break before the 7th Semester. Students will have time to read, and communicate with faculty before the deadline for signing up. Can I change my Seminar after signing up? No, once you have chosen you cannot change the seminar paper. It is expected you have communicated with the faculty before signing up. Does the Seminar need to be from my Major-Minor? No, the seminar has no impact nor is it shaped by your Major-Minor disciplines. List of themes for Batch 2019 will be available soon. 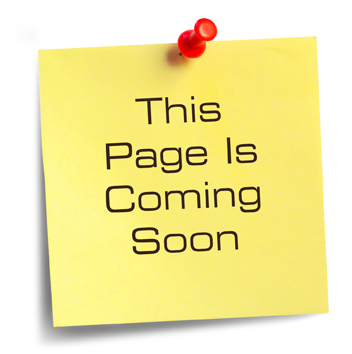 Online Koha book catalog- OPAC system. BCL ID library card are available in ssla library. ●Issue of books is available to all library members. ●Members are expected to keep their college ID card at the time of checking-out a book. days. A book, once issued, must be returned on or before the last date stamped on the Due Date slip, pasted on the first page of the book. ●Failure to return books on the due date will result in a fine of Rs. 5/- per day. In case of loss of a book(s), the member will either have to replace the same or pay the current value of the book. ●Students can issue and return books on all working days from▪9:00 a.m. to▪7:30 p.m.
●Students are not allowed to carry their bags into the library. There is a locker system outside the library where students can store their bags. ●Readers shall not write or mark (by underlining, putting brackets, etc.) on the< reading materials. Purchase suggestions:- All SSLA library members are allowed to recommend books. They should mail the librarian regarding book suggestions. Research is considered to be an essential part of academics in the process of understanding a subject thoroughly. It acts as a means of giving life to individual thoughts and beliefs. Therefore, SSLA encourages all students and faculty to undertake research work. For students, these assume the form of two major submissions in their fourth year, the dissertation and the final year seminar paper. Research-oriented writing skills are also essential to the completion of their Internship and Community Outreach Project reports. All students undertake an independent research project, and submit a dissertation as an essential part for the fulfillment of their undergraduate degree program. This project reflects a student’s Major and Minor subject of study. Student research is thus interdisciplinary in nature, and spans across the major and minor subjects offered at the school, ranging from philosophy to business studies, and from economics to biology. The rationale behind the final year seminar, is to inspire and equip students to deliberate on themes of their interest in an academic fashion, and to write a paper that satisfies standard academic conventions (substantive and formal). In order to encourage self-confidence, the final year seminar papers written by students are sent out for publication. Many of the noted journals including the International Journal of Social Science and Humanities Research, Journal of Integrated Social Sciences, International Journal of Humanities and Social Sciences, International e-Journal of Advances in Education, and Anthropology and Reinvention: An International Journal of Undergraduate Research, have accepted some of the papers written by students of SSLA, and given them a platform to showcase their research-related writing skills. In 2015-16, six of our students presented their papers at national and international conferences. Sana Vaidya presented a paper the FoHSS conference on Sustainable Development. 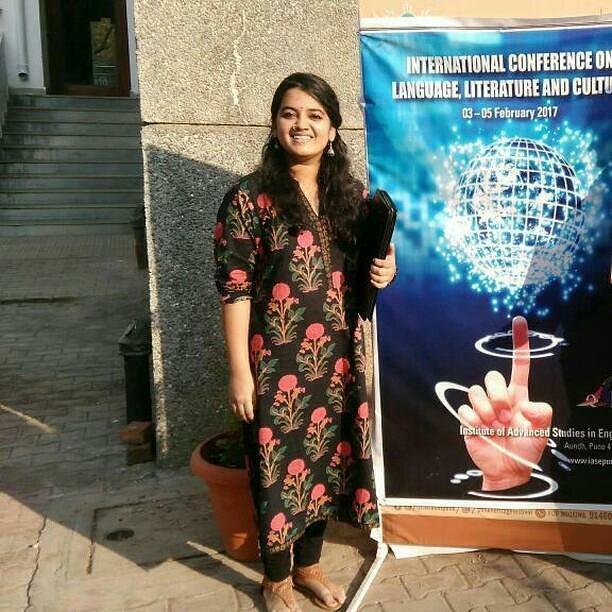 The paper was a faculty and student collaboration with Dr Shweta Sinha Deshpande, Sulakshana Sen, Ananya Gouthi Sana herself. 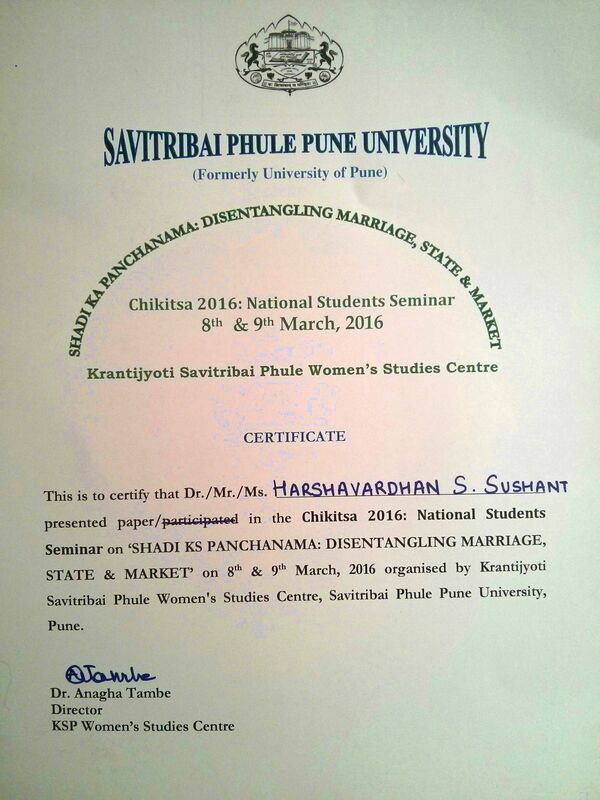 Nikita Anil Kumar along with Srushti Borkar presented a paper titled ' Indian Women in Science' on 16/2/2017 at the Faculty of Humanities and Social Sciences (FoHSS) conference that was held at Lavale. It was presented under the Education and Gender track. The paper looked at women who are studying STEM subjects as well as those already working in STEM. Common problems faced by women were described. To further this, the so talked to a few women who had jobs in the STEM fields to determine whether their experiences aligned with our research. A profile of the typical Indian woman scientist was then built. In addition, a review of the policies dealing with women in science was conducted and suggestions for improvements were made. 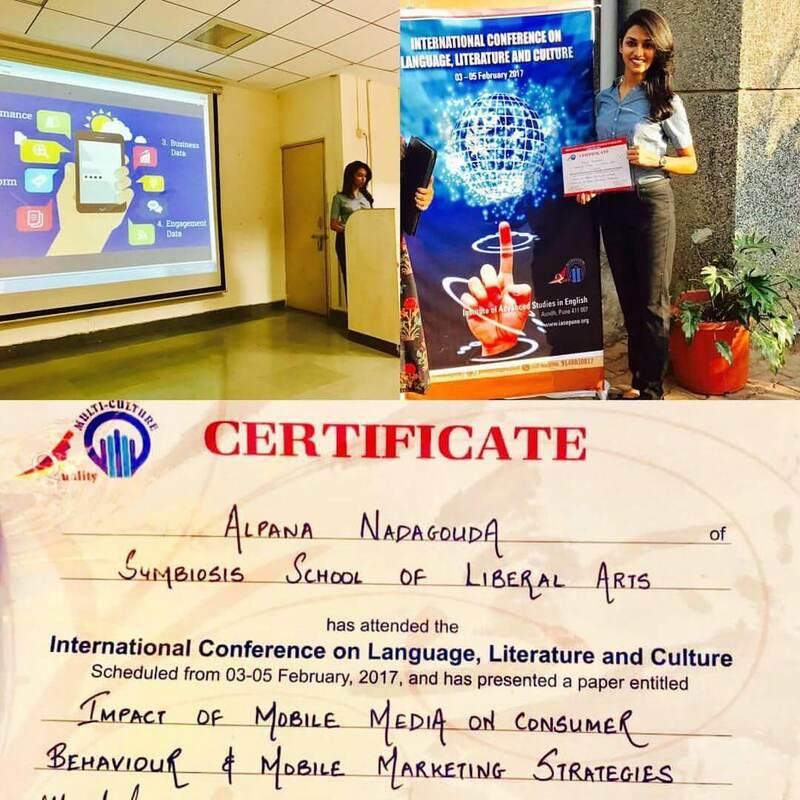 Her paper, 'The Impact of Mobile Media on Consumer Behaviour and Mobile Marketing Strategies' was accepted and thus, she was invited to present it. Alpana has received a certificate for the same. Additionally, her paper will be published. Sulakshana Sen Fulltime International Relations India's Foreign Policy, South Asia, Theory of International Relations, Performing Arts. Barry Rodrigue Fulltime Anthropology Human adaptation, global networking, ethnography, experiential learning, historical archaeology, creative arts, literature and composition, historical geography, outdoor fieldwork and exploratory trekking, collections development, big history, universal studies. Sandip Bhaise (Sandip Ravindra) Visiting Psychology Cognitive Psychology (Culture and cognition; music and cognition; emotions and cognition; applied cognition; social cognition; music and cognition)/ Psychology of technology/ Human-Computer interaction/ Efficacy of Psychotherapies, Buddhist Psychology (Mindfulness) and Phenomenology; Technology and Mind. Ananya Parikh Visting Film Studies early 20th century film, culture and art, adaptation studies and film and art theory. Pramod Menon Visting English literature English Literature 1780-1830, American Literature 1830-1880, Indian Writing in English 1930-1980. Isaac Parackal Visting Philosophy and Environment Anthropology and Ecology especially the interconnectedness between human beings and nature. Environmental philosophy(eco-philosophy or ecology) and existentialism in general. Contemporary issues like global warming, pollution(air, water, sound etc.). Submit the filled form and the DD to SSLA Exam Department. After the specified no. of working days, when SSLA receives your documents, you will get the intimation from SSLA Exam Department, then you may collect your certificate / Grade Sheet / etc. For backlog examinations the latest version of the syllabus will be used for paper setting. Hence for a particular examination season the same paper shall be used for both regular and backlog students. Student needs to give undertaking in this regard. The student will procure the latest syllabus for the Institute/Department and prepare for the backlog examination accordingly. With prior permission of the Institute/ Department, the student may attend classes to cover new topic with a convenient batch or any arrangement as provided therein. In case of annual pattern a backlog examination shall be conducted in each of the semester of a year or annually as per rules.